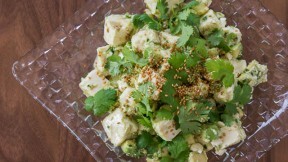 When a regular salad leaves you unsatisfied, try this tofu avocado salad recipe instead for a nutrient rich filling lunch. Food blogger Marc Matsumoto breaks down the flavor components of this recipe in a full post on the Fresh Tastes blog. Put the cubed tofu in a sieve or colander over a bowl to allow excess water to drain for at least 1 hour. This keeps the salad from getting watery. Cut the avocado in half, remove the pit, then peel and cube the avocado. Put the avocado in a non-reactive bowl and toss with the lemon juice to prevent it from changing color. Add the drained tofu, salt, sesame seeds, sesame oil, and scallions. Gently toss to distribute all the ingredients evenly. Top with cilantro and serve.